Angiotensin is an oligopeptide and is a hormone and a powerful dipsogen. It is derived from the precursor molecule angiotensinogen, a serum globulin produced in the liver. It plays an important role in the renin-angiotensin system. Angiotensin was independently isolated in Indianapolis and Argentina in the late 1930s (as 'angiotonin' and 'hypertensin', respectively) and subsequently characterised and synthesized by groups at the Cleveland Clinic and Ciba laboratories in Basel, Switzerland. Angiotensinogen is also known as renin substrate. Human angiotensinogen is 453 amino acids long, but other species have angiotensinogen of varying sizes. The first 12 amino acids are the most important for activity. 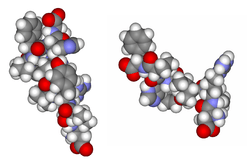 Angiotensin I (CAS# 11128-99-7) is formed by the action of renin on angiotensinogen. Renin cleaves the peptide bond between the leucine (Leu) and valine (Val) residues on angiotensinogen, creating the ten-amino acid peptide (des-Asp) angiotensin I. Renin is produced in the kidneys in response to renal sympathetic activity, decreased intrarenal blood pressure (<90mmHg systolic blood pressure ) at the juxtaglomerular cells, or decreased delivery of Na+ and Cl- to the macula densa. If less Na+ is sensed by the macula densa, renin release by juxtaglomerular cells is increased. Angiotensin I appears to have no biological activity and exists solely as a precursor to angiotensin II. Angiotensin I is converted to angiotensin II (AII) through removal of two C-terminal residues by the enzyme angiotensin-converting enzyme (ACE), primarily through ACE within the lung (but also present in endothelial cells and kidney epithelial cells). ACE found in other tissues of the body has no physiological role (ACE has a high density in the lung, but activation here promotes no vasoconstriction, angiotensin II is below physiological levels of action). Angiotensin II acts as an endocrine, autocrine/paracrine, and intracrine hormone. ACE is a target for inactivation by ACE inhibitor drugs, which decrease the rate of Angiotensin II production. Angiotensin II increases blood pressure by stimulating the Gq protein in vascular smooth muscle cells (which in turn activates an IP3-dependent mechanism leading to a rise in intracellular calcium levels and ultimately causing contraction). In addition, angiotensin II acts at the [[Na/H<sup>+</sup> exchanger]] in the proximal tubules of the kidney to stimulate Na reabsorption and H+ excretion which is coupled to bicarbonate reabsorption. This ultimately results in an increase in blood volume, pressure, and pH. Hence, ACE inhibitors are major anti-hypertensive drugs. Angiotensin IV is a hexapeptide that, like angiotensin III, has some lesser activity. When cardiac cell growth is stimulated, a local (autocrine-paracrine) renin-angiotensin system is activated in the cardiac myocyte, which stimulates cardiac cell growth through protein kinase C. The same system can be activated in smooth muscle cells in conditions of hypertension, atherosclerosis, or endothelial damage. Angiotensin II is the most important Gq stimulator of the heart during hypertrophy, compared to endothelin-1 and α1 adrenoreceptors. Angiotensin II increases thirst sensation (dipsogen) through the subfornical organ of the brain, decreases the response of the baroreceptor reflex, and increases the desire for salt. It increases secretion of ADH in the posterior pituitary and secretion of ACTH in the anterior pituitary. It also potentiates the release of norepinephrine by direct action on postganglionic sympathetic fibers. ↑ Basso N, Terragno NA (Dec 2001). "History about the discovery of the renin-angiotensin system". Hypertension. 38 (6): 1246–9. doi:10.1161/hy1201.101214. PMID 11751697. ↑ Williams GH, Dluhy RG (2008). "Chapter 336: Disorders of the Adrenal Cortex". In Loscalzo J, Fauci AS, Braunwald E, Kasper DL, Hauser SL, Longo DL. Harrison's principles of internal medicine. McGraw-Hill Medical. ISBN 0-07-146633-9. ↑ Le, Tao (2012). First Aid for the Basic Sciences. Organ Systems. McGraw-Hill. p. 625. ↑ Yvan-Charvet L, Quignard-Boulangé A (Jan 2011). "Role of adipose tissue renin-angiotensin system in metabolic and inflammatory diseases associated with obesity". Kidney International. 79 (2): 162–8. doi:10.1038/ki.2010.391. PMID 20944545. ↑ Kanaide, Hideo; Ichiki, Toshihiro; Nishimura, Junji; Hirano, Katsuya (2003-11-28). "Cellular Mechanism of Vasoconstriction Induced by Angiotensin II It Remains To Be Determined". Circulation Research. 93 (11): 1015–1017. doi:10.1161/01.RES.0000105920.33926.60. ISSN 0009-7330. PMID 14645130. ↑ Skurk T, Lee YM, Hauner H (May 2001). "Angiotensin II and its metabolites stimulate PAI-1 protein release from human adipocytes in primary culture". Hypertension. 37 (5): 1336–40. doi:10.1161/01.HYP.37.5.1336. PMID 11358950. ↑ Gesualdo L, Ranieri E, Monno R, Rossiello MR, Colucci M, Semeraro N, Grandaliano G, Schena FP, Ursi M, Cerullo G (Aug 1999). "Angiotensin IV stimulates plasminogen activator inhibitor-1 expression in proximal tubular epithelial cells". Kidney International. 56 (2): 461–70. doi:10.1046/j.1523-1755.1999.00578.x. PMID 10432384. ↑ Boulpaep EL, Boron WF (2005). Medical Physiology: a Cellular and Molecular Approach. St. Louis, Mo: Elsevier Saunders. p. 771. ISBN 1-4160-2328-3.
de Gasparo M, Catt KJ, Inagami T, Wright JW, Unger T (Sep 2000). "International union of pharmacology. XXIII. The angiotensin II receptors". Pharmacological Reviews. 52 (3): 415–472. PMID 10977869. Lees KR, MacFadyen RJ, Doig JK, Reid JL (Aug 1993). "Role of angiotensin in the extravascular system". Journal of Human Hypertension. 7 Suppl 2: S7–12. PMID 8230088. Weir MR, Dzau VJ (Dec 1999). 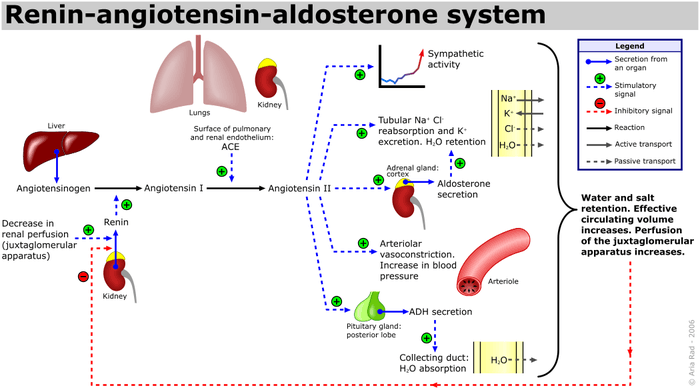 "The renin-angiotensin-aldosterone system: a specific target for hypertension management". American Journal of Hypertension. 12 (12 Pt 3): 205S–213S. doi:10.1016/S0895-7061(99)00103-X. PMID 10619573. Berry C, Touyz R, Dominiczak AF, Webb RC, Johns DG (Dec 2001). "Angiotensin receptors: signaling, vascular pathophysiology, and interactions with ceramide". American Journal of Physiology. Heart and Circulatory Physiology. 281 (6): H2337–65. PMID 11709400. Sernia C (Jan 2001). "A critical appraisal of the intrinsic pancreatic angiotensin-generating system". JOP : Journal of the Pancreas. 2 (1): 50–5. PMID 11862023. Varagic J, Frohlich ED (Nov 2002). "Local cardiac renin-angiotensin system: hypertension and cardiac failure". Journal of Molecular and Cellular Cardiology. 34 (11): 1435–42. doi:10.1006/jmcc.2002.2075. PMID 12431442. Wolf G (2006). "Role of reactive oxygen species in angiotensin II-mediated renal growth, differentiation, and apoptosis". Antioxidants & Redox Signaling. 7 (9-10): 1337–45. doi:10.1089/ars.2005.7.1337. PMID 16115039. Cazaubon S, Deshayes F, Couraud PO, Nahmias C (Apr 2006). "[Endothelin-1, angiotensin II and cancer]". Médecine Sciences : M/S. 22 (4): 416–22. doi:10.1051/medsci/2006224416. PMID 16597412. Ariza AC, Bobadilla NA, Halhali A (2007). "[Endothelin 1 and angiotensin II in preeeclampsia]". Revista De Investigación Clínica; Organo Del Hospital De Enfermedades De La Nutrición. 59 (1): 48–56. PMID 17569300.